FIRST LOOK: Twilight Eclipse poster - see Robert Pattinson and Kristen Stewart smoulder! FIRST LOOK: Twilight Eclipse poster – see Robert Pattinson and Kristen Stewart smoulder! The first official Twilight Eclipse poster - see it here! 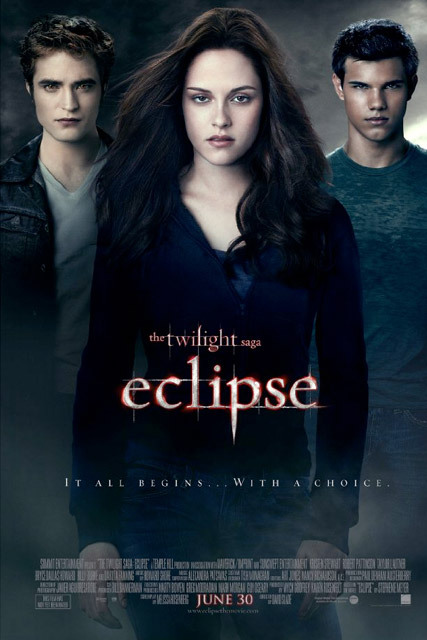 Be calm, Twilight fans – you might still have three months to wait until the release of Eclipse, but until then, we have the very first official poster for the third flick in the saga for you to swoon over! The release was also accompanied by an official plot description, which reads: ‘In THE TWILIGHT SAGA: ECLIPSE, Bella once again finds herself surrounded by danger as Seattle is ravaged by a string of mysterious killings and a malicious vampire continues her quest for revenge. WATCH THE TWILIGHT ECLIPSE TRAILER HERE! TWILIGHT GALLERY: THE STARS, THE STILLS AND MORE!